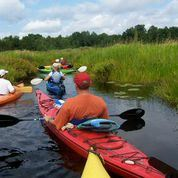 Kayaking or canoeing is a great way stay in shape before the ski season, and it is a fun adventure exploring the many lakes and streams that surround us. We paddle until the snow stops us at various locations throughout central New York and also near our ski club lodge in central Vermont. Everyone is usually ready for some refreshments and food after a good paddle, so we then decide on a local restaurant to replenish our bodies. Check out the paddling schedule on the Club Calendar . If you want to find out what's going on at the moment, pose a question, or have an online dialog with others who are interested in kayaking or canoeing, you can go to the Kayaking/Canoeing Forum.